The numbers are staggering and sad. In India, millions of children and adults are living with disabilities, and support services that are readily available in other countries simply don’t exist in India. For example, in the 2011 Indian Census, under the heading Disability in Movement, is a category entitled Those Who Crawl. Historically,substantial physical or spiritual assistance has not been offered to children with special needs. To meet this need, God called LCMI to begin reaching out to those with special needs and to their families through Special Needs camps. At our Special Needs camps, our goal is to minister to the special needs campers, and to their families. It is important that we share with them that every person is made in the image of God, and is valuable in His eyes. For many of them, it is the first time they hear that they are special. Parents share that they are amazed by the love being shown to them and their children, in a country that follows traditions that exclude them and treat them as outcasts. We also teach practical ways to care for their children, and provide needed medical supplies and equipment. A wheelchair or a walker could give such a person mobility and dignity, but these relatively inexpensive devices simply aren’t available to many Indian people who need them. One of the goals of our Special Needs Camps is to provide wheelchairs, walkers, crutches, and other support items for children with special needs. 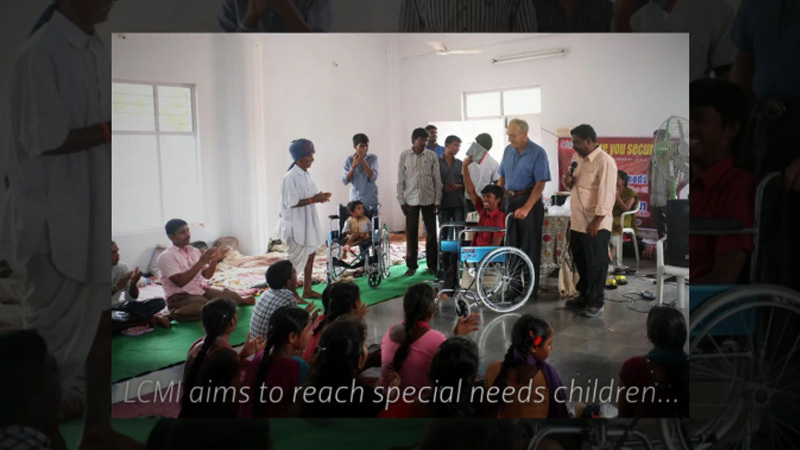 To bring the Gospel to children with special needs and their families. To give special needs children and their families the love and care of Christ, showing them that they are valuable and unique. To create awareness, and to educate and train parents and guardians on how to care for children with special needs.